DermInk is an internationally renowned professional medical camouflage practice with clinics in San Francisco and London specialising in improving the appearance of scars and skin colour imperfections. Using high quality dermatologic hypoallergenic medical pigments, we specialise in correcting or minimising trauma and cosmetic scars, birthmarks, stretch marks, Vitiligo, and other skin colour abnormalities. Theresa qualified as a Bachelor of Medicine and Surgery in Australia and specialises in advanced scar and skin colour restoration and skin abnormalities, working in private practice with clinics in the US and London. Please Note: Theresa is not acting in the capacity of, or as, a diagnosing Physician. There is no reciprocities between States or Countries. In some instances a referral from a local Dermatologist may be required before treatment may commence. 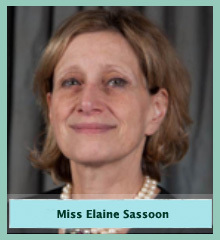 Miss Elaine Sassoon MBBS FRCS (Plast) is one of the UK’s leading consultant Cosmetic Surgeons, having trained both at Harvard University in the USA and University College Hospital in London. Elaine specialises in a wide range of facial and body rejuvenation procedures including, eye lifts, brow lifts and facelifts as well as all types of breast surgery and other cosmetic and aesthetic procedures and has received numerous awards both in the USA and UK for her outstanding work including the National Clinical Excellence award (ACCEA) in 2010. As a serving council member of the British Association of Plastic Reconstructive and Aesthetic Surgeons, Elaine is at the forefront of her profession, offering a unique blend of surgical skill and professionalism combined with an artistic appreciation and attention to detail whilst retaining a caring patient focus and approachability that defines her. "I treat every patient as an individual spending as much time as necessary to understand their own particular needs and requirements, offering professional advice and endeavouring to ensure a natural looking result." Elaine has undertaken overseas attachments in performing surgery and microsurgery in South Africa; France; Bosnia; Taiwan; New Orleans, USA as well as overseas fellowships in Ljubljana, Slovenia (microsurgery) and Atlanta, USA (oculoplastic and aesthetic surgery) as well as running several regional, national and international courses in Plastic Surgery. Author of ‘The Boudica Within’ and former guest editor of the British Journal of Plastic Surgery, Elaine is also a Fellow of the Royal College of Surgeons, a member of the British Association of Plastic Surgeons, and a Corresponding Member of the Aesthetic Society (USA) and Chairman of the Breast Subcommittee of the British Association of Plastic Surgeons. Elaine is bi-lingual in French and lives in central London. Patients are referred through prominent Plastic/Cosmetic Surgeons and Dermatologists nationwide, including Stanford Dermatological Surgery Department at Stanford University, Palo Alto Medical Foundation, Sutter and El Camino Hospitals. Medical Micropigmentation is a highly specialised field dedicated to ‘normalising’ irregular skin colour that has proven otherwise impervious to lasers and ultraviolet treatments. Scars, burns, and other skin colour imperfections can be minimised or completely hidden by blending custom mixed Hypoallergenic flesh coloured medical pigments into the skin, rendering surface imperfections inconspicuous even on close inspection, permanently. By working closely with leading Dermatologists and Surgeons, we offer exceptional standards of service, quality and safety in a convenient, calm and luxurious medical environment.